April 25th, 2010 by KTU | Filed under 5. 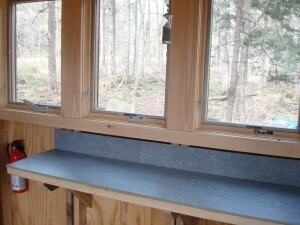 Interior Details, Notes on Approaches, Vermont Mini Cabin. The click system comprises tiles which are about 3/8″ thick. The bulk material is basically a sawdust-polymer composite of some kind, with the colored surface making up the top layer. A fussy little profile is milled into the edges so that the tiles are supposed to click together. Except they don’t. I tried installing the material the first time in December. 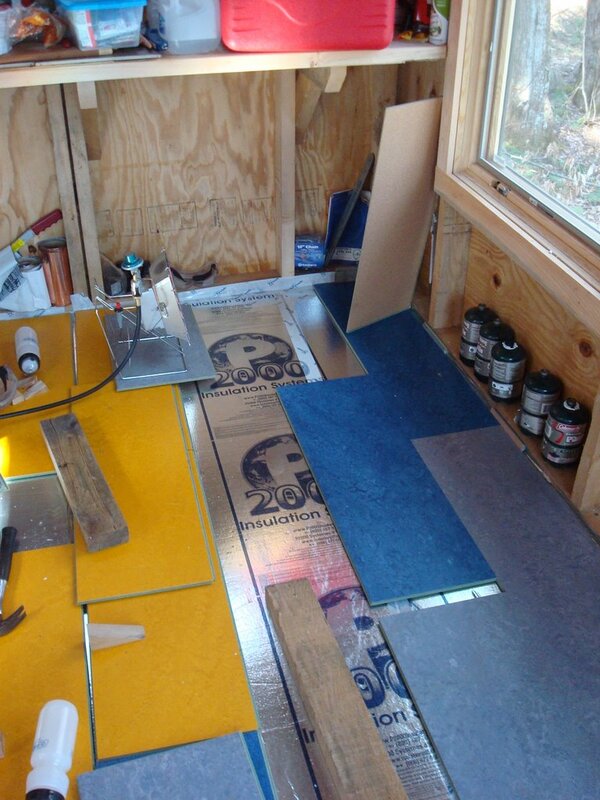 Despite the Morso Squirrel cranking away, I couldn’t get the floor above about 55F, and I assumed that the low temperature was the reason I couldn’t get the tiles to click together. So, I came back this past weekend (end of April) and tried again. At about 65F, they still wouldn’t really click together reliably. I tried bringing everything up to a higher temperature (by getting the interior temperature up to 90F for an hour or two). I even tried warming the tiles directly with a propane heater. Even when really warm, I couldn’t get these tiles to click together predictably. Sure, I could get a couple of tiles to click together. But, that’s not what the instructions say to do. The instructions have you assemble an entire row of tiles (16′ long in my case), perch the row on little wedges and then “click” in the entire row. Give me a break. That just doesn’t work. Warming tiles with propane heater. Assembling a row and positioning for the magic click. After about three frustrating hours, I noticed that the instructions listed a hammer as a required tool. Hmmm….a hammer? What would you need a hammer for? 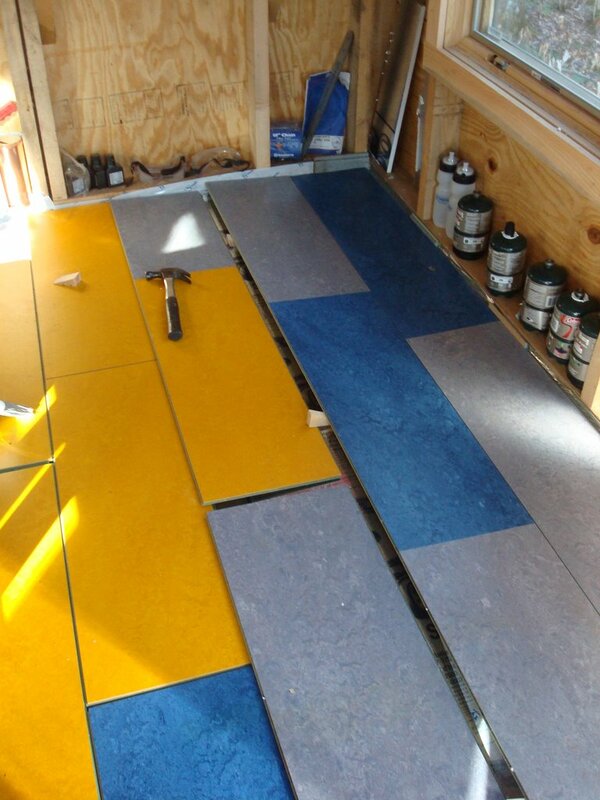 The instructions don’t say, but I eventually discovered that the “click” tiles can be installed as you would a Pergo/Laminate “wood” floor. You hammer them into place by using a little piece of a spare tile to engage with the tile you are trying to persuade and then hammer on a wood block up against that little interface. That worked pretty well. Once I figured that out, I was able to fly along pretty well and got the floor installed in another three or four hours. I’m very happy with the result. I am just not convinced that this system actually works as advertised, except possibly in a perfect Swiss laboratory. (In Forbo’s defense, this is the “old” Click system…bought on sale. There is a new system…but who knows if the installation is any easier. I’d use these tiles again. They’d work quite well over concrete, I think, if you wanted to really brighten up a room. There are dozens of fun colors. I mixed and matched three colors without being persnickety about pattern, and I think the look is cool. I had a few tiles left, which I used to put a top on my little counter. It came out quite nice, in my opinion. Given that I spent less than an hour on it and that the material was left over, it beats the cardboard I had been using previously. Marmoleum counter top made from leftover tiles. Could you give advice, what cover better for nursery, marmoleum or carpeting, please? This is a sluggish reply. Sorry. Personally, I’d probably go with carpet. Carpet is generally less expensive and will give you a warm, comfy floor for a child to play on. 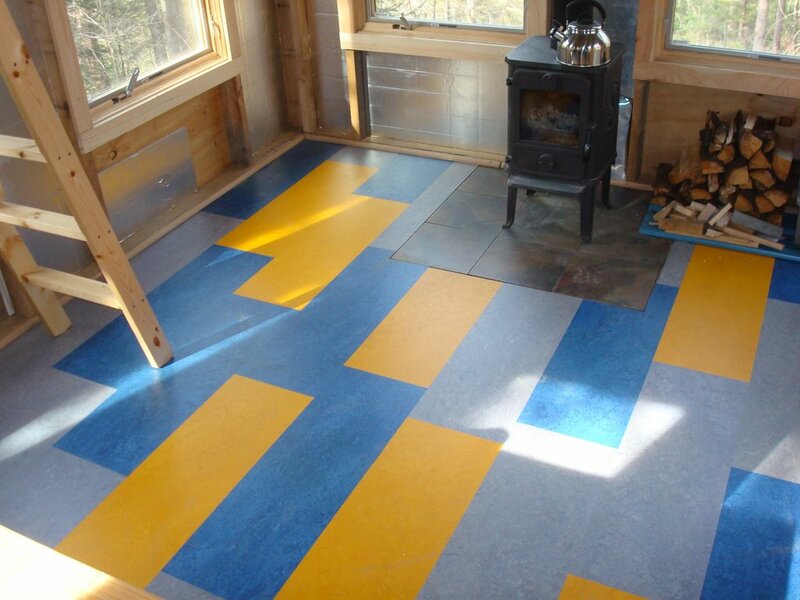 Of course, a hybrid solution would be Marmoleum with an area rug. Thinking about doing the same.